Often I get the question where I find all the cute mini items that I use as probs in the photos I post here and on instagram. The size of doll accesories that I need for my Mikodesign dolls are not a regular size that you can find in every doll or toy shop or if you find them they will be very pricy. The best place to start looking are the secondhand shop and you local department store. In the netherlands I find the best things at Hema, Xenos, Tiger, Action and Dille& Kamille. On the internet Etsy is also a great place to look for doll accesories, the sewing machine and camera stamp I found at a japanese stationary shop. *a perfect shop to find doll kitchen supplies is Dille& kamille, here I found the small wooden spoon and they have very cute small wooden plates, glass bowls and much more..
* the plastic hanger came with some socks we bought recently and makes a perfect doll clothes hanger. 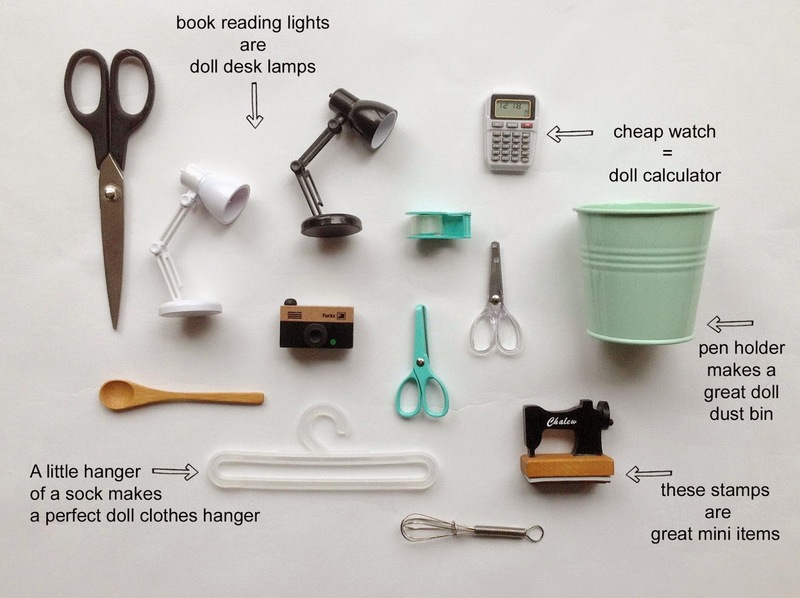 Ohhh I want those tiny scissors and lamps! I wish Tiger and these shops could ship to North America.